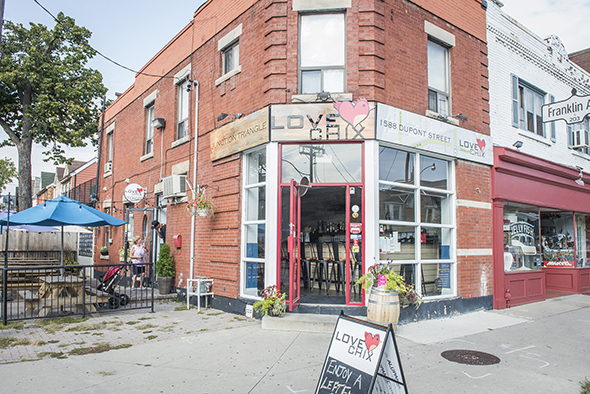 Love Chix is a restaurant serving up some really great roasted chicken. Who doesn't love chicken? The concept behind this place is as simple as that, but there's a great deal of thought being put into the food by team of chefs Paul Marshall and Punit Sehgal. They first worked together at Toronto's Scaddabush. Sehgal also has experience working at Montecito, and was professionally trained in Italy. That along with a childhood in Bombay have given him the palate and skill set to create truly great comfort food, and his dad sending spices from India to the restaurant doesn't hurt either. Marshall was a restaurateur in Vancouver before moving to Toronto. The interior is super spacious, with a pick-up counter at the back for take-out orders. 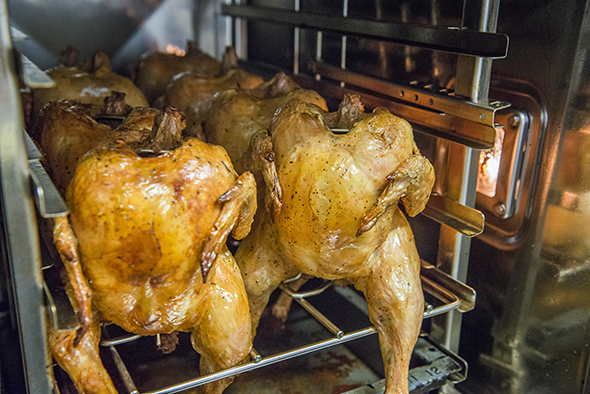 That's also where the magical Rational combination oven cooks chicken all day, rotisserie-style, and the combination aspect allows Marshall to run with his imagination on other dishes, too. 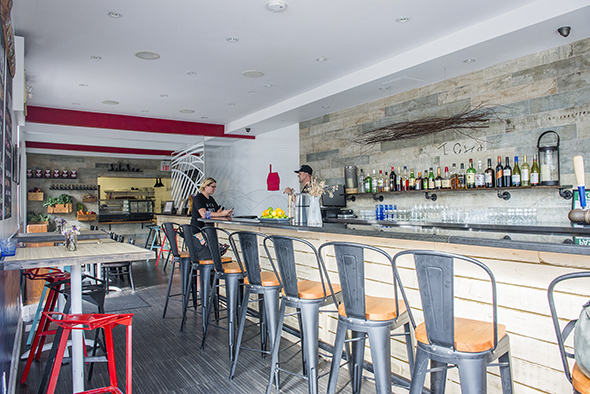 There are about forty seats outside and in, and rustic but modern touches balance out the place's look. Love Chix has an extensive alcohol selection, and what I like best are the fourteen feet of tall boys kept in fridges behind the bar, all with matching glassware. However, they also do cocktails like the Drake & Stormy ($13), inspired by our fave Toronto it couple, Drake and Rihanna. 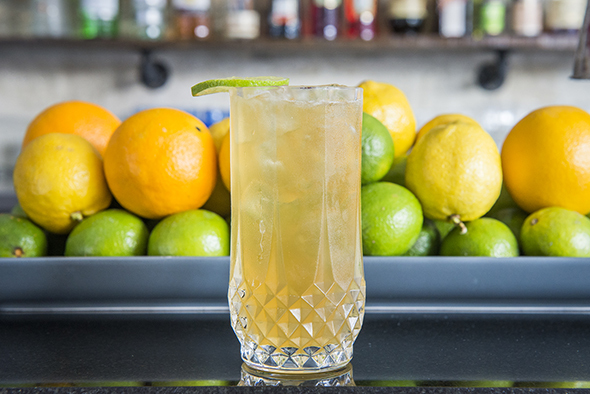 It's made with Boylan's W&P heritage ginger beer, Mount Gay, and richened with a shot of Hennessy. 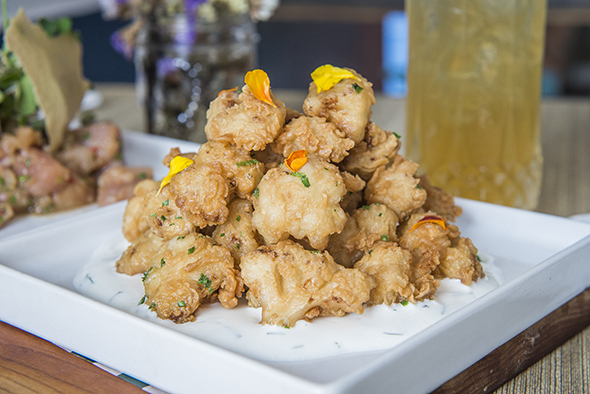 Appetizers are upscale and off the beaten track, like popcorn cauliflower ($8) soaked in buttermilk, dredged in seasoned flour, deep fried in brown butter, and piled atop a pool of buttermilk ranch and garnished with edible flowers. 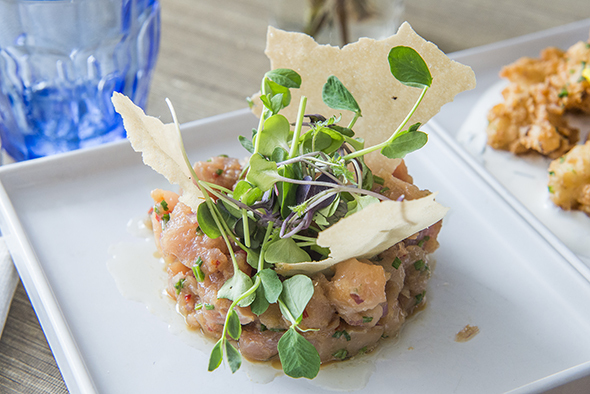 Another app is the tuna tartare ($12), a date night no-brainer. It's albacore with a soy ginger vinaigrette, mixed with shallots and anaheim chilis and topped with microgreens and rice crisps. The thing to come here for is unarguably the chicken. They use "yellow chicken," antibiotic and hormone-free from the best supplier they can find for the best price point so it doesn't get into the unaffordable territory of organic free-run chicken. Cold rather than typically hot water is used for the defeathering process, apparently much better for the meat. They serve it with their personal secret version of a Chalet sauce, and the "Small Family" combo ($32) comes with two sides, which you choose from eight options, four hot and four cold. 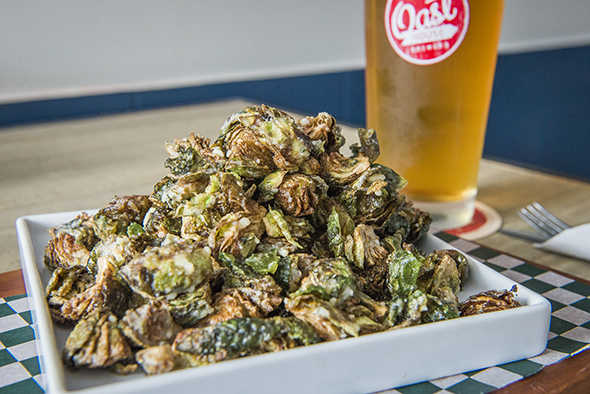 I recommend the brussel sprouts ($7 on their own), a recipe popular with Marshall's patrons in Vancouver, fried and topped with grana padano, lemon juice, and "a little special something." 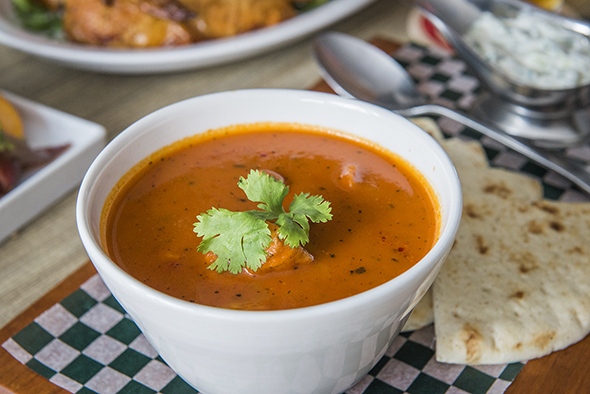 You'll also want to try the bird prepared as a butter chicken dish ($18): though the naan isn't house-made and this item is everywhere in Toronto, the spice blend makes it a standout.